The legendary One Shot Charlie’s is open year round. During the summer enjoy our deck, watch the beautiful sunset and listen to live bands every Friday and Saturday night. In the off season we have monthly themed parties, live music on select evenings and don’t miss our Annual New Year’s Eve Prime Rib Dinner! Cozy up by the wood fireplace and have a little taste of heaven with our House Made Hot Buttered Rum! #thehillsucks … Join us this summer on our new ride! 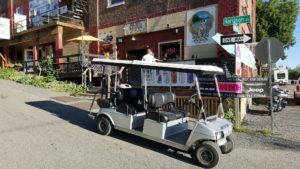 We will be shuttling visitors to and from the docks and One Shot Charlies. Call us for a FREE ride!